Podcast editing is easily the most time-consuming aspect of podcasting. However, with a consistent workflow in place, you shave off the time it takes you to edit down your podcast, all while improving the quality of your final audio file. 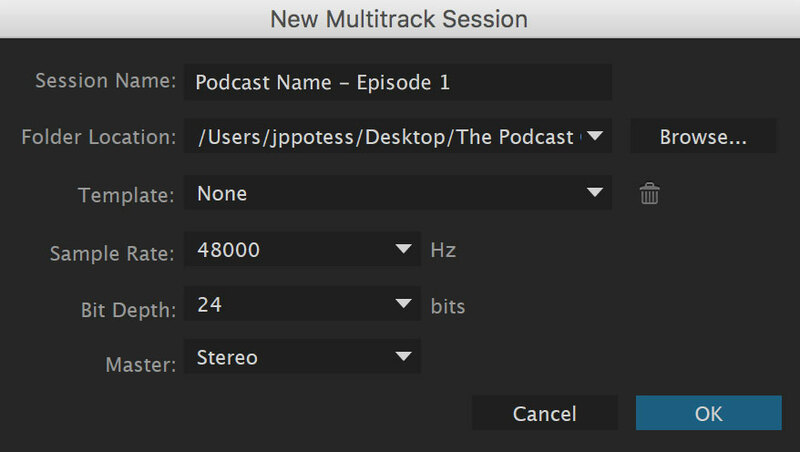 In this post, we'll go through the steps we take when mixing and editing a podcast episode start-to-finish. By following through this post you'll pick up some tips and tricks that you an implement into your own podcast editing workflow that improve your episodes. We use Adobe Audition for all of our work. 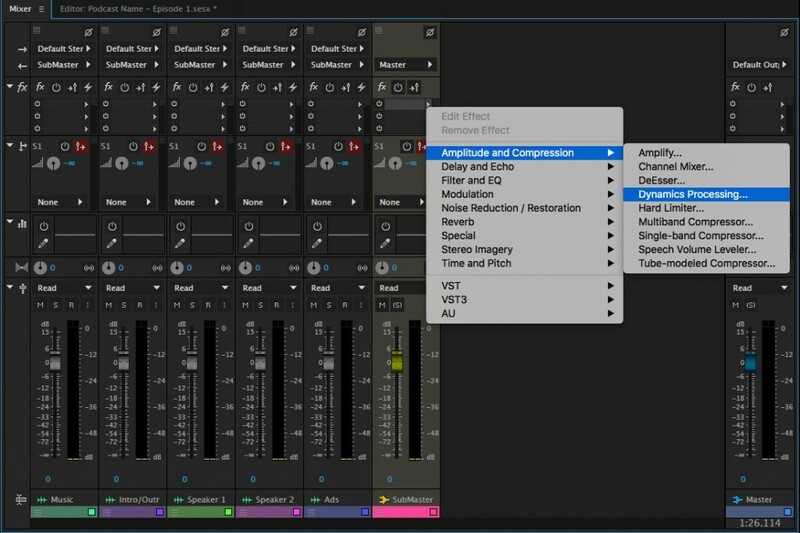 This choice is mainly due to the focus Audition places on its built-in audio correction suite - which you'll see used multiple times in this post. 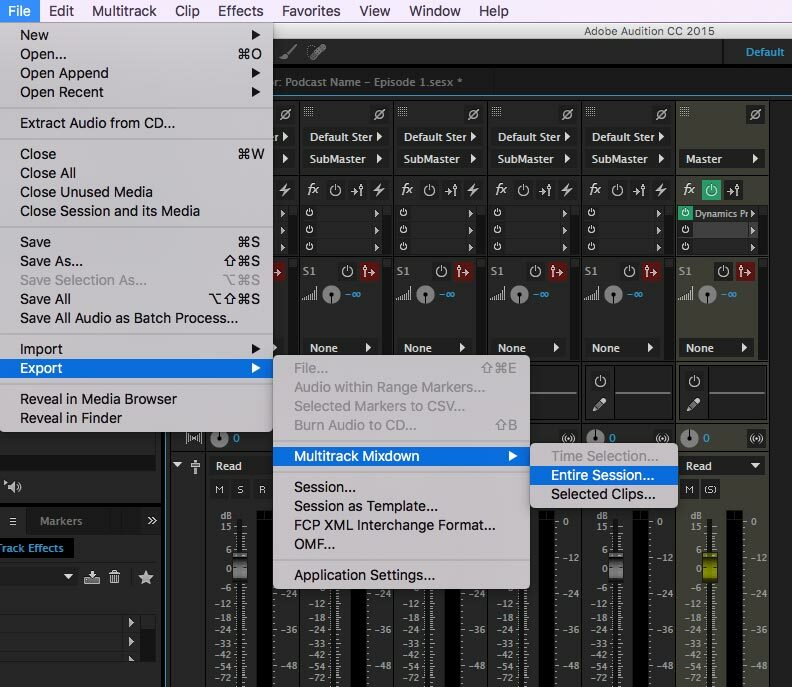 Although our workflow uses Audition, these same practices can be used in any professional Digital Audio Workstation (DAW) and in many free DAWs to varying degrees. We can break up our process into four main sections: Project Setup, Audio Cleanup, Episode Editing and Final Episode Mixing. Let's get started! File > New > Multitrack Session and save the project into our 'Final' folder. We'll set our sample rate to 44.1K and our bit depth to 24 bits. Depending on the quality of your raw files, you might set this to different values. Regardless of what your initial settings are, we'll bounce down to 44.1k at 16bits for the final file. Stereo Bus Track to use as our sub-master. Bus tracks are simply a way to route audio, in this case, we'll use them to combine all of our audio before sending it to our master track. Now, we can name the tracks for each of their functions, and change our routing on each individual track from sending directly to "Master" to send our "sub-master" bus. **Pro Tip - Save this file as reusable template so you can easily select it when creating a new project for future episodes. Import all of the audio files into your main project bin. 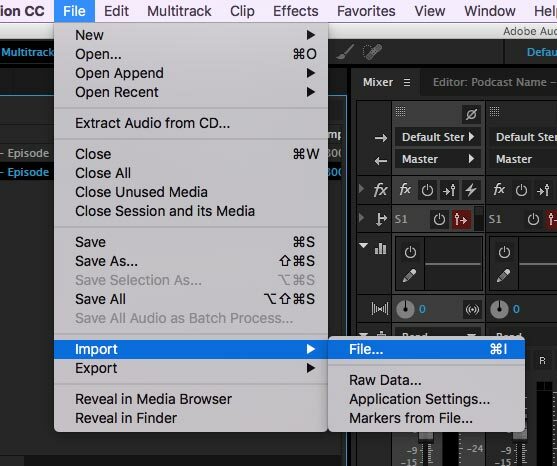 Adobe Audition gives you a few ways of doing this, we'll just add them directly using the importer. If you've recorded a stereo track that uses the left signal for one speaker and the right for another, now's the time to split it into two mono tracks so that you can work with each one individually. 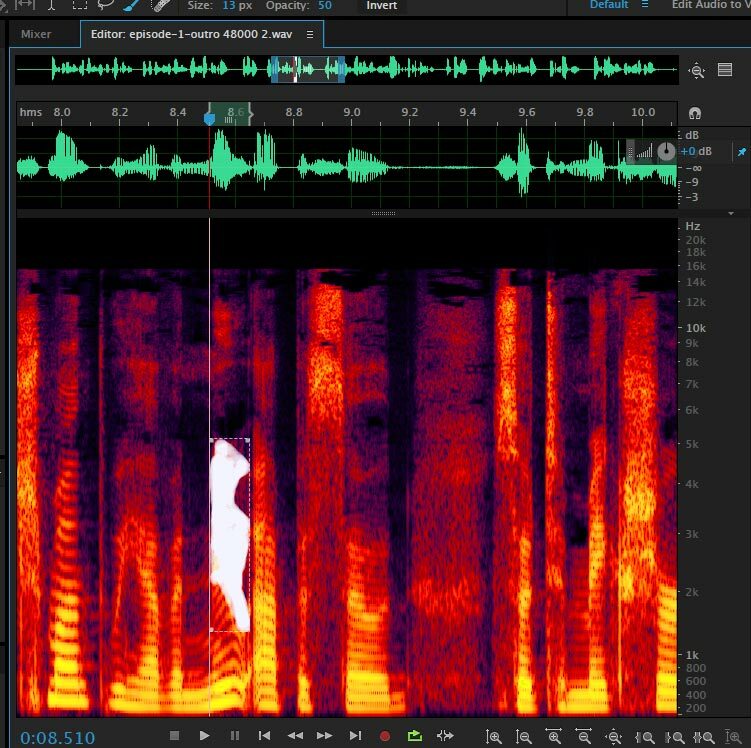 In our example, you can see that the intro for the episode "episode-1-intro" was recorded stereo and has the same audio waves on both the left and right channel. The main audio file, however, is a stereo track with the first speaker in the left channel and the second speaker in the right. This can be a little tricky to find if you're not in the correct editing view, so first, make sure you're in the "Waveform" view by clicking the waveform tab in the top left of the screen. 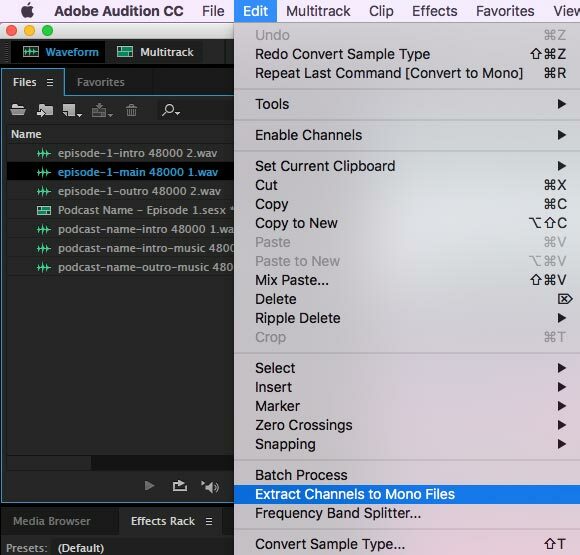 Then, select the track in your files bin and click "Extract channels to mono files" from Edit > Extract channels to mono files. This results in two mono tracks in your audio bin and you can pull them into your project into the correct tracks. The idea here is to perform audio correction on each audio file individually before mixing them all together. 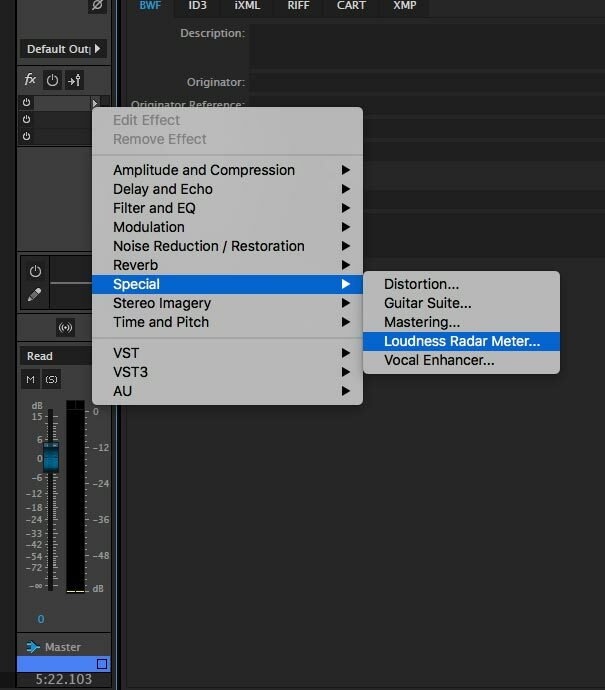 The order of operations DOES matter here - especially with compression - you need to remove problems in your audio before boosting it or you'll cause more problems for yourself down the road. 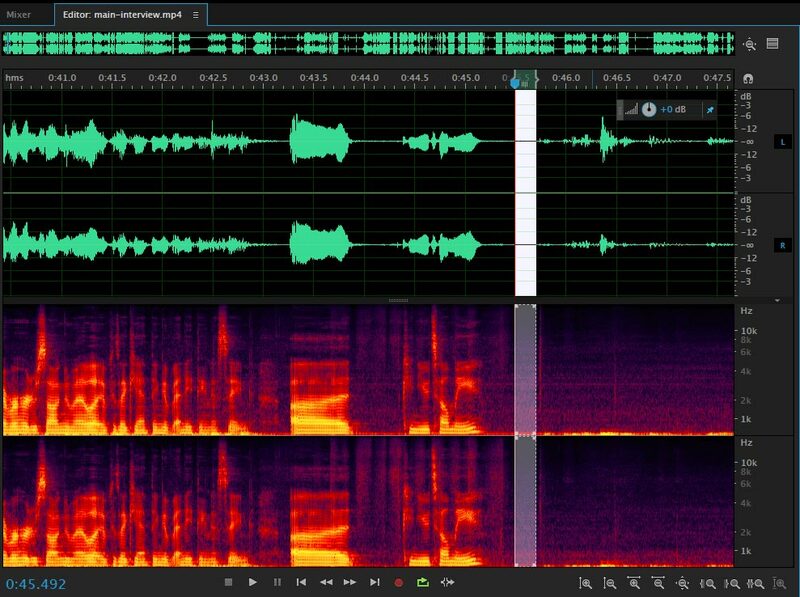 We won't go into detail for each of these steps as they really require full posts to really dig deep into them, but we'll cover where these tools are in Adobe Audition and the order they should be performed in. To work on each audio file individually, we'll be in the Waveform Editor window. You can open up a file in the waveform editor by double clicking on the actual waveform in the Multitrack Editor view. 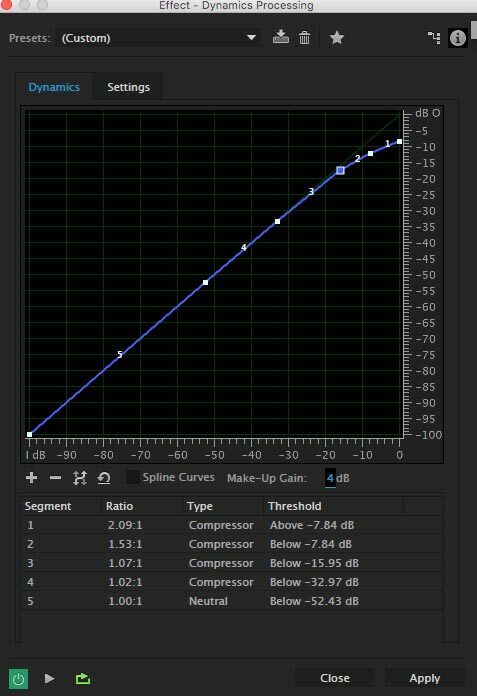 Audition has a fantastic built-in tool - the spectral frequency display - in the Waveform Editor view - which we'll be working with a lot during audio correction. Basically, the spectral display shows audio gain and frequency visually. The x-axis is representative of time and matches the normal waveform view above. The y-axis is used for frequency starting at 0 H and going all the way to 20,000 Hz on a logarithmic scale. What makes the spectral display particularly useful is the color of the waveforms matches the level of the frequency. 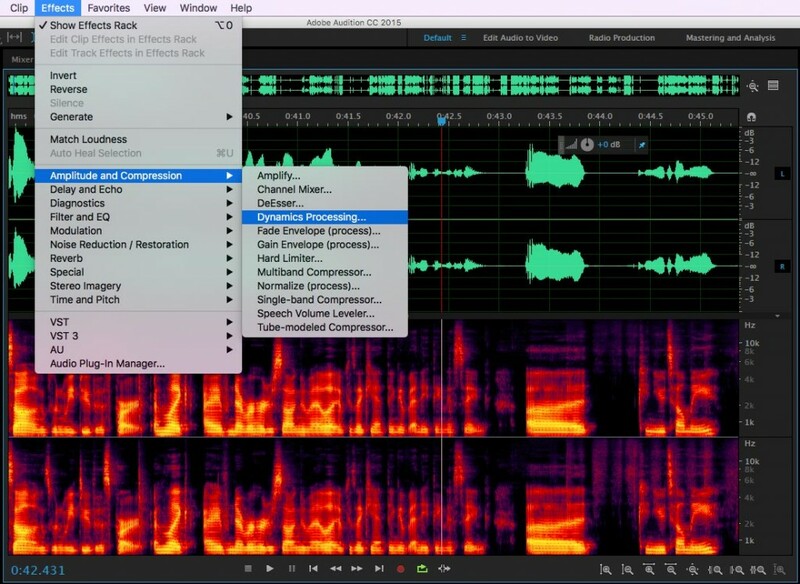 This lets you visually see how your audio sounds. If you haven't worked with a spectral display before, this can take some getting used to. 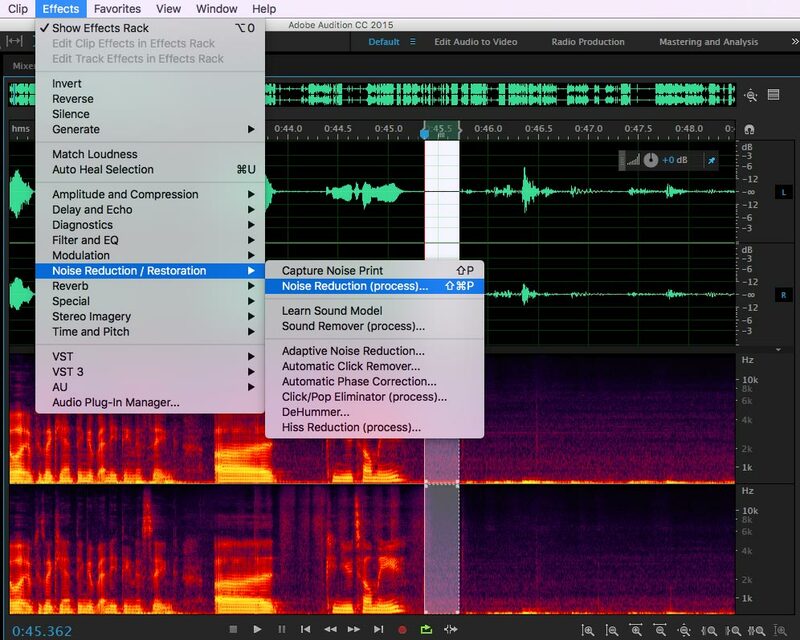 After you get the hang of it, it becomes an indispensable tool for audio correction. Usually, you're going to have some type of low-level noise on your tracks, this is especially common when recording straight to your computer and not an external audio recorder. Taking a look at our example audio file, we can see that there some low-level background noise all the way up to around 10kHz. We'll take care of it using Auditions built-in Noise Reduction suite. First, we'll select a section of the audio that contains only the background noise we want to reduce, then we'll capture the noise print. Once we have the noise print captured, we'll remove the background audio using the Noise Reduction Process. ** Pro Tip - after dialing in the noise reduction, make sure you use CMD + A (Mac) or CTR+ A (Windows) to apply your changes to the entire audio file. 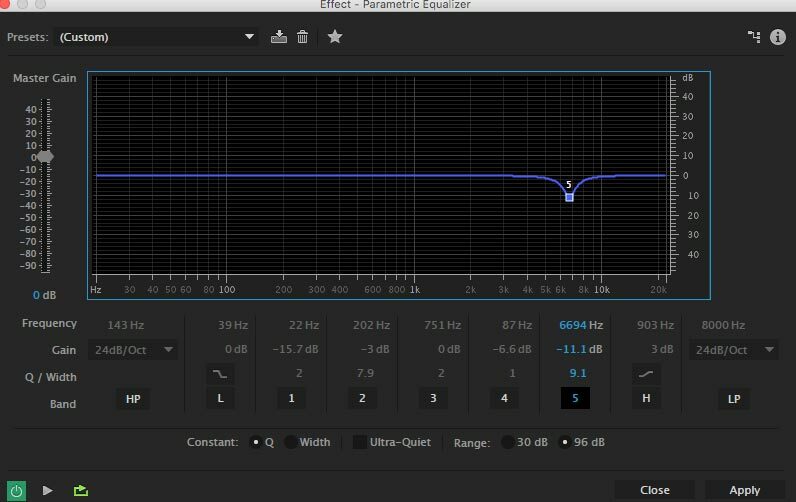 EQ can be used to fix a multitude of issues you can get when recording your podcast that causes it to sound at best unnatural and in worst case scenarios abrasive and annoying. In this example, we're reducing some of the sibilance (hissing sound caused by the letter 's') from our main interviewer's voice. Select your entire audio file and open up the parametric EQ effect. In this particular case, we need a deep cut at around 6.5K to get our desired effect. 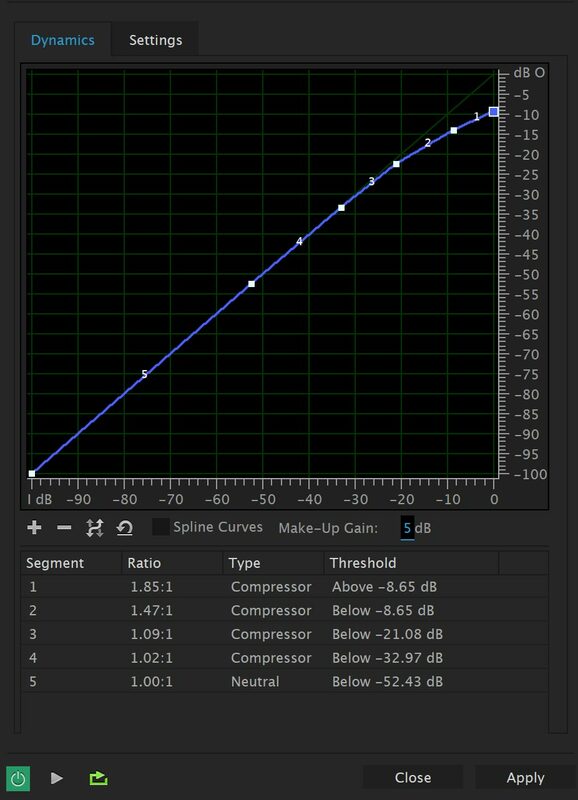 Audio compression is used to get a consistent level across your audio file so that your finished episode doesn't have your listeners changing the volume every five minutes when someone gets excited about a topic or slightly turns their head when speaking. We'll do some mild compression on this file to get more consistent levels. After you've cleaned up all of your audio tracks individually, it's time to move back into the multitrack editor and edit together our episode. First, line up any tracks that so that they're all in sync. Thento get a rough layout of how the show will go, lay out all the pieces into the order they'll go to get the general flow before editing. 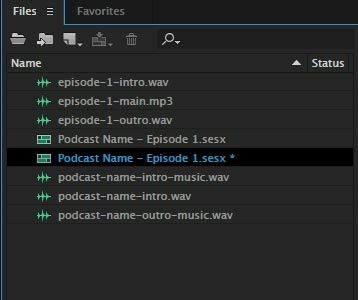 Depending on the style and format of your podcast, the actual episode editing process can look very different. For some podcasts, this will just cut silence at the beginning and end of the track, for others, it means editing down and tightening up every phrase. You'll save yourself literally hours of time if you do these specific changes as you come across them when editing together the episode. Fix these the same way you did when editing the individual tracks - double click on the track in the Multitrack Editor view - it'll open up the Waveform Editor view where you can make your changes. 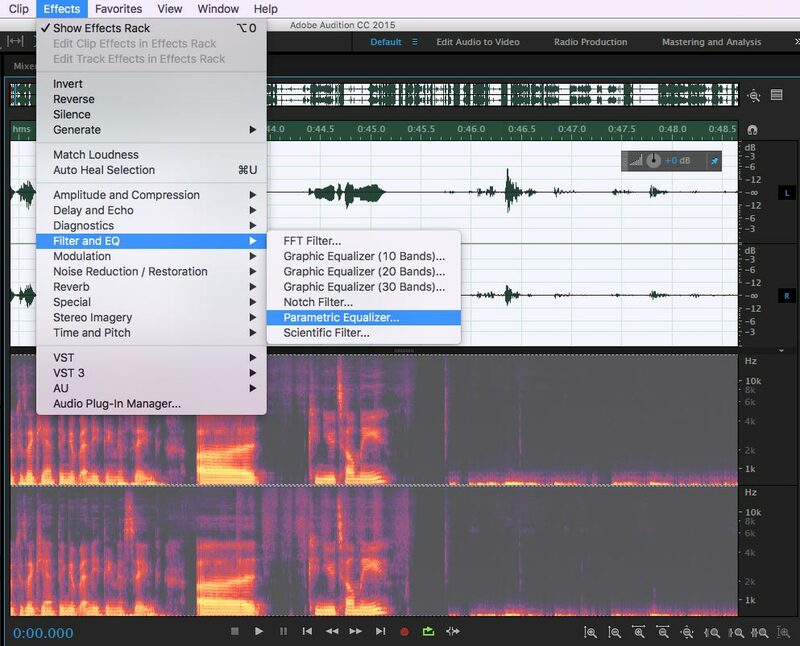 You can get more granular by zeroing in on the specific section problem area in your waveform using the paintbrush tool and using the Spectral Frequency display. After you select the problem area, you can process it using any of the plugins available to you. 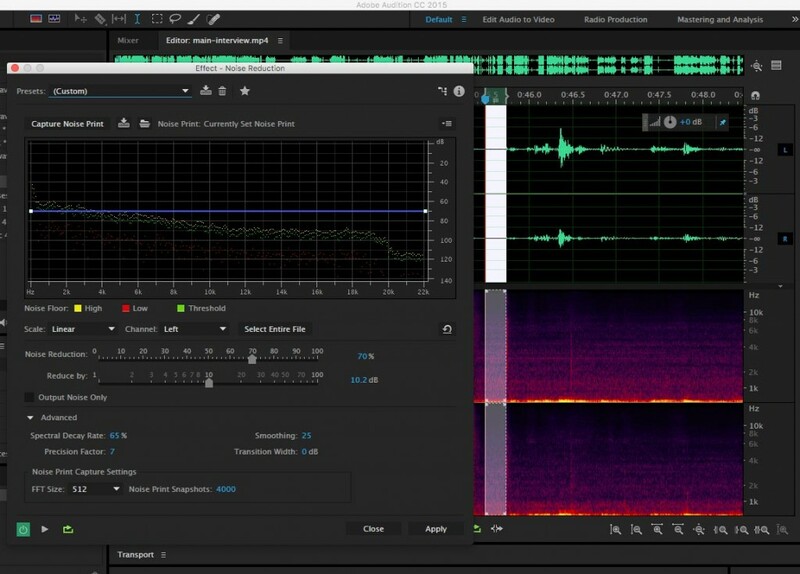 The precision provided by the paintbrush tool and the Spectral Frequency display are some of the main reasons we've decided to use Adobe Audition for all of our editing needs. After you've put together your entire episode, it can beneficial to do a final round of light compression to smooth out the levels between different tracks. 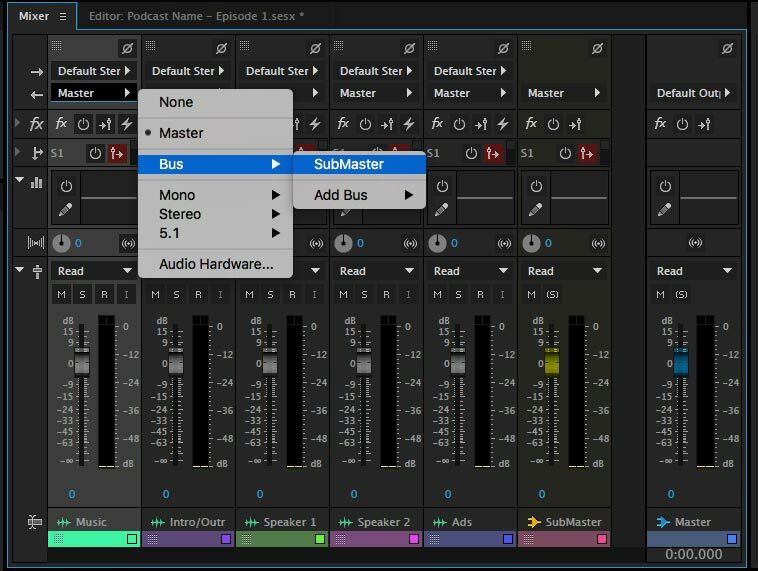 This time, instead of doing the compression directly on the audio waveform, we'll place the compression plugin on the sub-master bus we created earlier by adding it directly to the track in the Multitrack Mixer view. 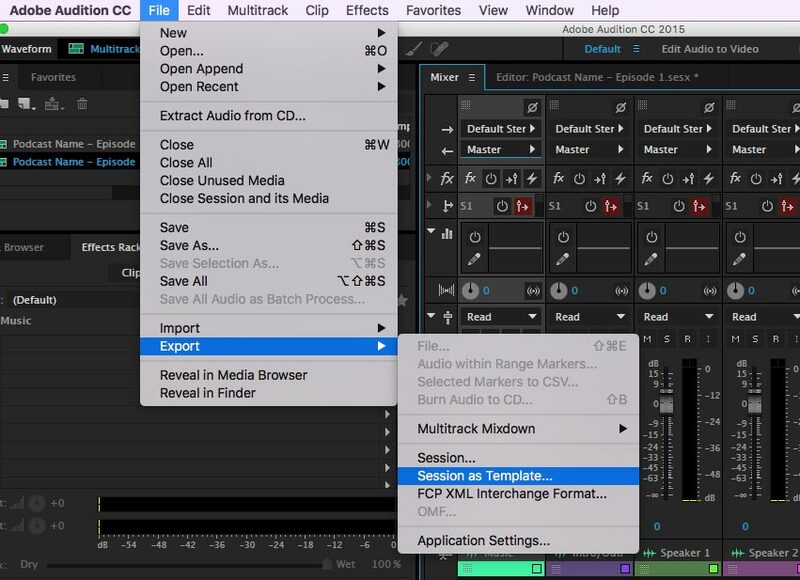 You won't need to apply the plugin like you did in the Waveform Editor view. Since the plugin is placed in the effects rack, it routes the sub-master audio through that effect before sending it out to our master track. Our final quality check is to check the leveling of our finished track. Audition provides a powerful Loudness Radar Meter to give you an accurate representation of your loudness levels. We'll add this to the master track and then check our levels. 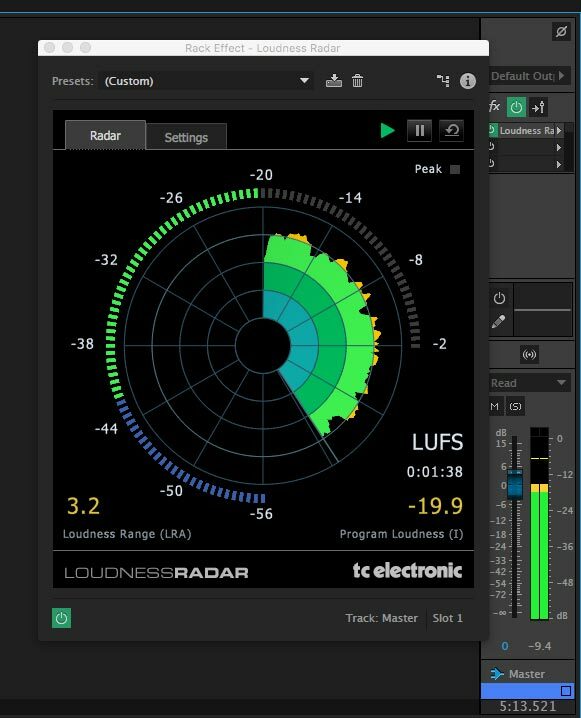 We shoot for 16dB LUFs, so after configuring our settings, we play through our episode and make sure we're consistently in our target range. All that's left now is to export our finished episode as an MP3. Hopefully, you've picked up useful processes to improve your own workflow.